Nick Lowe's, "(I Made An) American Squirm"
See above. He's bragging about how he made love to an American woman. By George, he's got it! 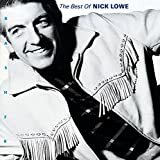 Nick Lowe's, "Love So Fine"
OK, OK, Nick, your girl has some great physical and sexual qualities to her. The great 1979 album that features this song is so well crafted and witty and got high critical praise across the board. Ain't it better to boast about that?